We offer over 90 brandable styles to choose from, with new styles added regularly to keep you on top! Our amazing selection of customizable and portable chargers for your car, home, or on the go! Shop our custom printed selection of high tech audio goodies like earbuds, headphones, Bluetooth speakers and more! Look for great tech promotional items like these cases, stands, armbands and other popular accessories designed for phones and tablets. Promotional tech gifts include the latest crazes and tried and true gadgets. Need some ideas? Check out our selection of our most popular products that will look great with your company logo! *On select products, some restrictions may apply. Promo America is a promotional electronics company determined to help you market your brand with only top quality products. High tech promotional gifts are the markets hot and effective advertising tool that is guaranteed to reach a large willing audience. We specialize in mobile accessories like earbuds, chargers, and speakers, for favorite portable devices like smartphones and tablets. Our wide selection and devotion to service allows us to cater to all of our customer’s needs. 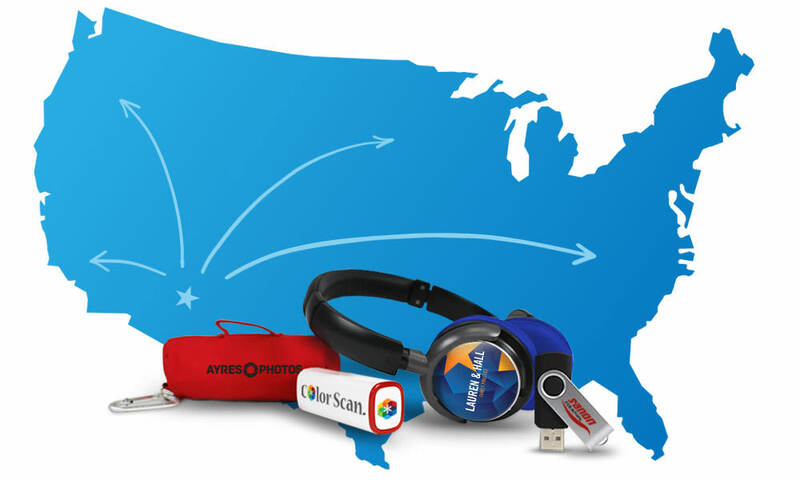 We have some of the fastest turn times in the industry because we source and stock most promotional items in the USA. All of our products are printed right here in our Phoenix location. Orders can be completed in as little as 24 hours. Keep an eye out for our latest gadgets, we’re always adding more! © 2019 Promo America. All rights reserved.